Parody books have been trending for a while now and it was only a matter of time before some of the world’s best-loved classics had a reworking. While there have previously been ‘modern retellings’ of some of Shakespeare’s plays in emoji format (see my review ), and a few reproductions of other well-known classic authors such as Enid Blyton, we are only now starting to see a new range of stories coming into the mix. Adding her own unique spin to authors such as Oscar Wilde, F. Scott Fitzgerald, Jane Austen and William Shakespeare, Eliza Garrett has introduced an animal element to the parody genre by making the starring characters into cats and dogs. In each book she has changed the characters names slightly to reflect their newfound breeds. For example, Dorian Grey becomes Dorian Greyhound, while Basil Hallward becomes Basil Bassett and Lord Wotton becomes Lord Wooffon. Keeping with the theme, she also changes words like portrait (pawtrait) and uses animal mannerisms to convey how the characters are feeling (they whine, drool, whimper and sniff one another). These plays on words, as well as these familiar feline and canine characteristics, are continued throughout the series. Each book is also illustrated with the animal characters costumed in the time the book is set. 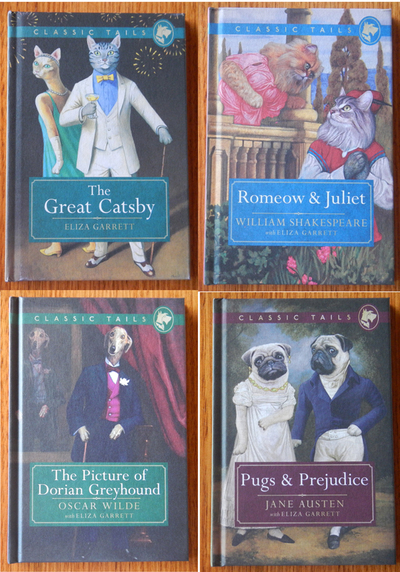 In The Great Catsby, you will find felines dressed in flowing flapper dresses and dapper suits, while the dogs in Pugs & Prejudice wear clothing from the regency era. The illustrations- which are produced by different people- perfectly compliment the text on the adjoining page. If you’re looking for a unique take on some classic tales, you can’t go past these animal-themed reproductions. With clever text, and traditional illustrations with a twist, they lend a quirky sense of fun to some old masterpieces.